An Army Tactical Power Generation Specialist doesn't generate power, but the Army couldn't keep things moving without filling this position. This soldier oversees the power generation equipment across the Army, including combustion engines and power plants. This job is categorized as military occupational specialty (MOS) 91D. A power-generation equipment repairer is responsible for supervising and performing maintenance and overhaul of power-generation equipment, internal combustion engines and associated equipment in mobile and stationary power plants. This job used to be known by the slightly less glamorous but more descriptive title of "power-generation equipment repairer." 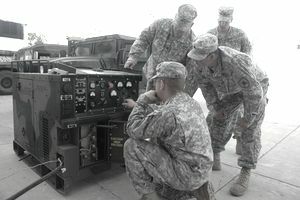 These soldiers conduct maintenance on tactical utilities, power generation sets, internal combustion engines and associated equipment. They're responsible for overhauling said equipment, and also perform maintenance and other repair work on mobile and stationary power plants. Job training for a tactical power generation specialist involves ten weeks of basic combat training (also known as "basic" or boot camp) and 12 weeks of Advanced Individual Training with on-the-job instruction both in the classroom and working on maintaining electrical power systems. Some of the skills you will learn include; the total operations of generator and power plants, electrical generation and distribution, diesel generator operation, disassembly, inspection and maintenance, and the basic principles of electrical and electronic circuitry. There are a couple of options available to qualify for this job. As with any Army job you'll first take the Armed Services Vocational Aptitude Battery (ASVAB) tests, which measure your compatibility and aptitude for different Army careers. For MOS 91D, you'll need either a 98 in the general mechanical (GM) aptitude area of the ASVAB or an 88 in GM and an 88 in the general technical (GT) area. There's no Department of Defense security clearance required for this job, but normal color vision (no colorblindness) is allowed for soldiers doing this work. If you have experience using or repairing hand and power tools, you'll be a step ahead of the game. Interest in electricity will be useful, and if you've ever worked with large machines, or are interested in doing so, this job should be a good fit for you. There are numerous civilian jobs that will be open to you with the skills you learn as MOS 91D. You should be able to work as a power plant electrician at a construction company, manufacturer or utility company.